The Pollogen OxyGeneo technology is a cutting-edge anti-aging solution that redefines cosmetic treatments. Unlike any other treatment on the market, OxyGeneo technology simultaneously and effectively provides 3 essential skin-care treatments to deliver superior facial treatment results; skin oxygenation, fine lines and wrinkle reduction, hydration and nourishment, and evens skin tone and texture. Pollogen Ltd., a global leader in medical aesthetic devices, and DermaSpark, a veteran marketer of high-end aesthetic solutions in Canada, are pleased to announce that Spa Utopia has introduced OxyGeneo treatments as one of their premium facial skincare solutions in all three of their locations in British Columbia, Canada. The award winning Spa Utopia has been recognized as one of the top 50 spas in Canada for excellence in the health and wellness industry. OxyGeneo by Pollogen is a breakthrough skincare technology that performs three skin rejuvenation actions simultaneously: gentle skin exfoliation, infusion of essential revitalizing nutrients and natural skin oxygenation. The Super Facial “3 in 1” skin care approach creates an optimal environment for absorption of essential nutrients both during and after treatment. It is an anti-aging solution that is suitable for all skin types and colors. “We are excited to include OxyGeneo as one our premier facial skincare solutions. Our spa guests are extremely satisfied with their results; even after their first treatment they already notice diminished lines and smoother skin. We couldn’t be happier with this gentle and effective treatment.” – Awni Abu-Ulba, Owner Spa Utopia. We believe in constantly challenging ourselves to create the most advanced, effective medical aesthetic technologies and solutions. We believe in thinking differently. Pollogen is the developer and manufacturer of six revolutionary technologies under the industry premier brand names OxyGeneo™, Hybrid Energy™, VoluDerm™, TriPollar®, TriLipo® and TriFractional™. 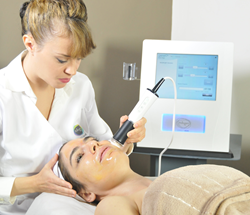 We offer a full line of clinically-proven, safe and effective, non-invasive anti-aging facial and body contouring treatment platforms for a wide range of aesthetic applications. Pollogen provides solutions for professionals in over 60 countries, addressing the specific needs and dynamic changes unique to the ever-evolving aesthetic industry.